Edit: I got my $2.80 and $2.90 numbers mixed up (in my own head, mainly) earlier on. The floor level seems to be $2.80, but two of my neurons weren't conversing well and I wrote about $2.90, which wasn't the idea, honest. I've now changed the script numbers, but to bear witness to the brainfart I'm leaving the chart note unchanged. I personally have been riffing on the $3/lb level for weeks and months without paying a great deal of attention to the charts. Copper's weakness in the last 24 hours got me looking more closely, because I'm a long-term bull on the price and wanted to know if I'm in the process of making a big mistake by holding onto a bullish attitude here (oil price and all that jazz). I was surprised to see the $2.80/lb level, one that's just about holding today, as important as it seems to be in longer-term price support terms. Therefore I don't think my bull case for copper is dead yet, though it's going to be the metal to watch in the days ahead. 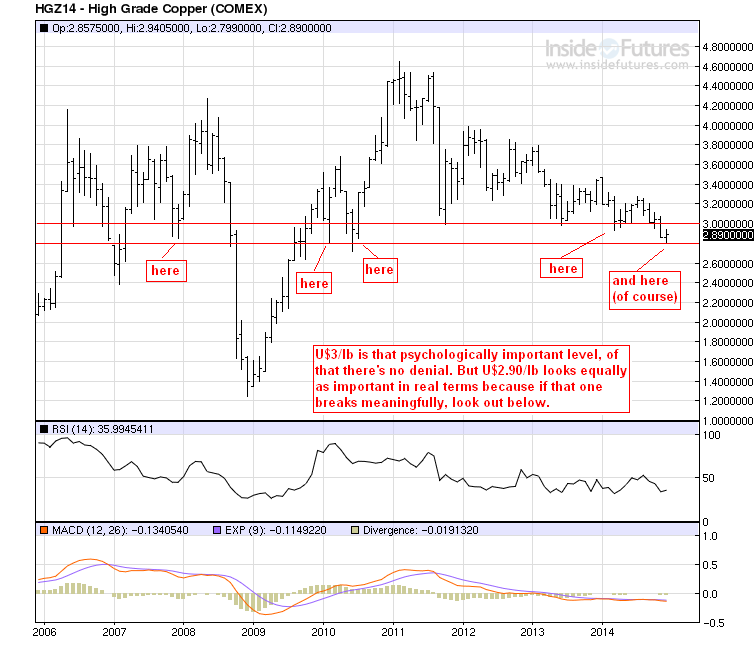 Gold and silver can do what they want, copper is the key.